The Chordettes were a female popular singing quartet, usually singing a cappella, and specializing in traditional popular music. 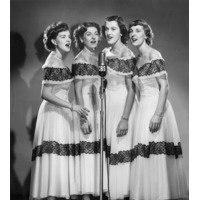 The Chordettes were one of the longest lived vocal groups with beginnings in the mainstream pop and vocal harmonies of the 1940s and early 1950s. Although the arrangements owed more to The Andrews Sisters than doo-wop, they did, unlike many of their peers, prove fairly adaptable to the rock and roll era. First establishing themselves with the huge hit record, "Mr. Sandman" in 1954, they continued to chart in the last half of the 1950s and the early 1960s, often with cover versions of rock and R&B songs. Their No. 2 1958 success "Lollipop" was the biggest of these. Although their sound was among the most conventional of rock artists, they introduced enough rock style into their repertoire and production, to sound more contemporary than they had on records such as "Mr. Sandman." They had an enormous fan club base led by Jody Destefano, president of their International Fan Club, who organized thousands of Chordettes fans from her home in Union City, N. J. A monthly newsletter was sent to the many chapter presidents all over the world, keeping them informed of the upcoming appearances of the famous group. The Chordettes always gave the fan club their personal attention.